Our organization is offering an alluring range of Embroidery Shawls that add a classic and elegant touch to the attire. These shawls provide great comfort and style due to its delicately soft feel and attractive designs. Moreover, we make use of finest threads to do the embroidery, which helps us ensure flawless finishing. We are offering a wide collection of embroidered shawls (AWMFC-8 E), which is 100% woolen, with machine embroidery. 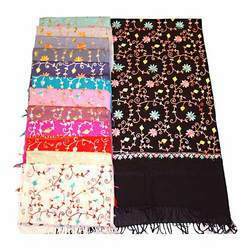 These embroidered shawls of 70 x 200 cm sizes are available in multi colors combined with traditional and modern designs. Our complete range is extremely comfortable, warm and trendy, that makes it highly demanded amongst our international buyers. We bring forth for our clients a wide variety of embroidered shawls (AK-Silky-Jaal) that highlight a classic woven floral embroidery pattern. 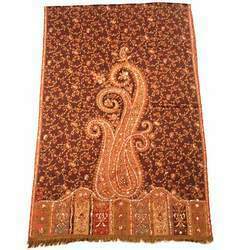 These embroidered shawls are available in vibrant paisley designs with 70 x 200 cm sizes that are ideal for these embroidered shawls. We are offering an enticing array of embroidered shawls (AK 7 Variety) that is crafted with sophistication and elegance. These 100% woolen shawls with printing & embroidery reflects a clear reflection of the meticulous workmanship and conventional art form. Our luxurious collection of embroidered shawls of 70 x 200 cm is made from high quality materials using latest efficient techniques. We are offering embroidery shawls (AK-7ari-ambi-jaal) that is 100% woolen stole with allover machine. 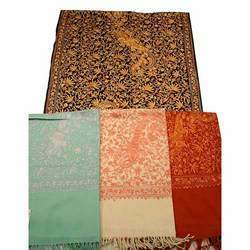 These embroidery shawls 70 x 200 cm shawls are available in pleasing colors with elegant embroideries. Crafted using quality fabric, these shawls can be made available in any design, embroidery and color as per the specific requirements of our clients. Looking for Embroidery Shawls & Scarves ?